Ancestral Transmission 3 - a Matsés future, sustainable art and creating alternatives. Following our first two reports where we have highlighted various Matsés traditional practices and ongoing projects alongside the NGO Acaté Amazon Conservation, our third and final report will focus some more on the importance of art in Matsés culture while glimpsing into village life at night, learning of alternative sustainable projects and sharing thoughts on what the future holds for the Matsés. 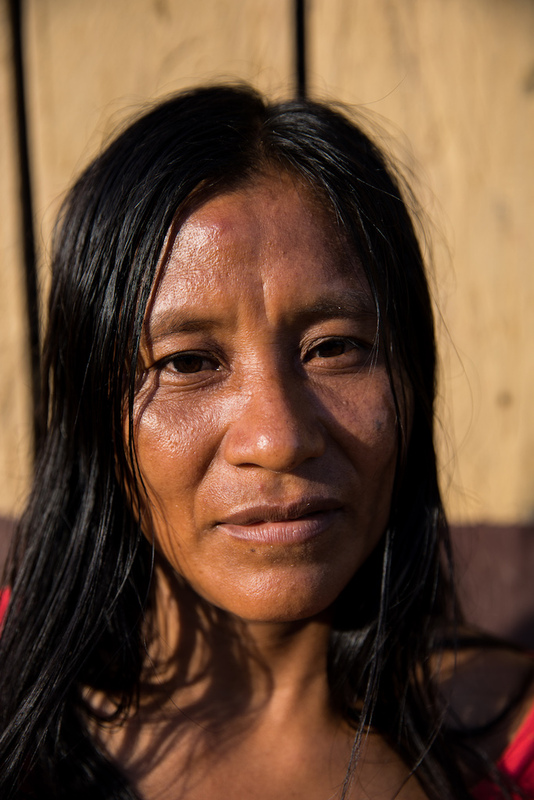 The continuation of ancestral practices is vital for the Matsés, part of the process of cultural revaluation that is key in a sustainable and long-term ‘bicultural’ future. If you missed it, please see the blog ‘Matsés Cultural Preservation and Biculturalism’ featured in our last report written by David W. Fleck. 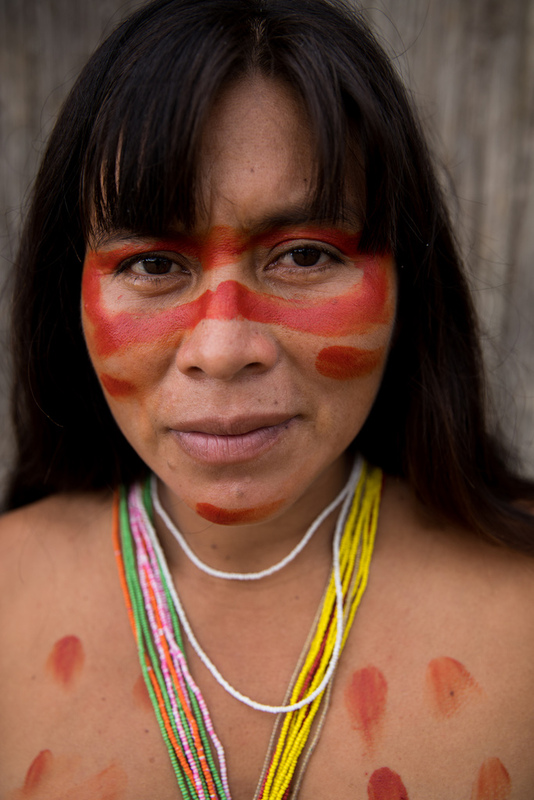 The future is now for all indigenous peoples in the Amazon, what will we do? 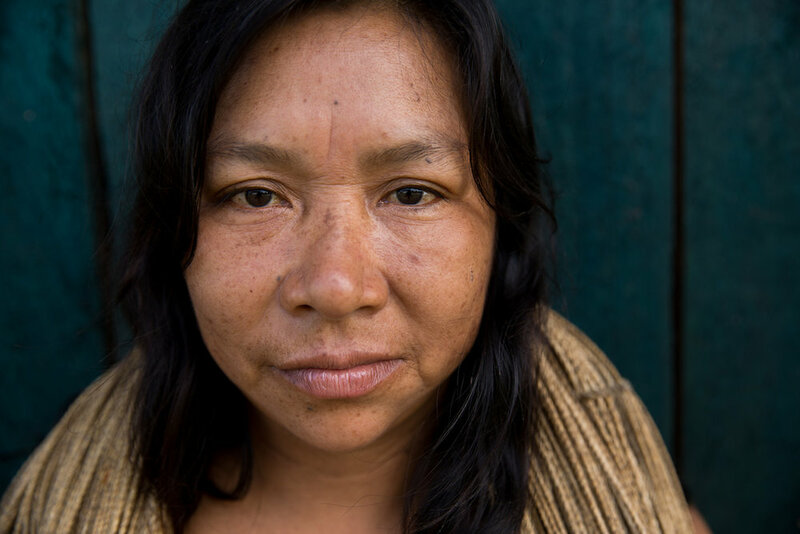 The Matsés live in the Javari valley, some of the most remote rainforest in the world on the Peruvian / Brazilian frontier. 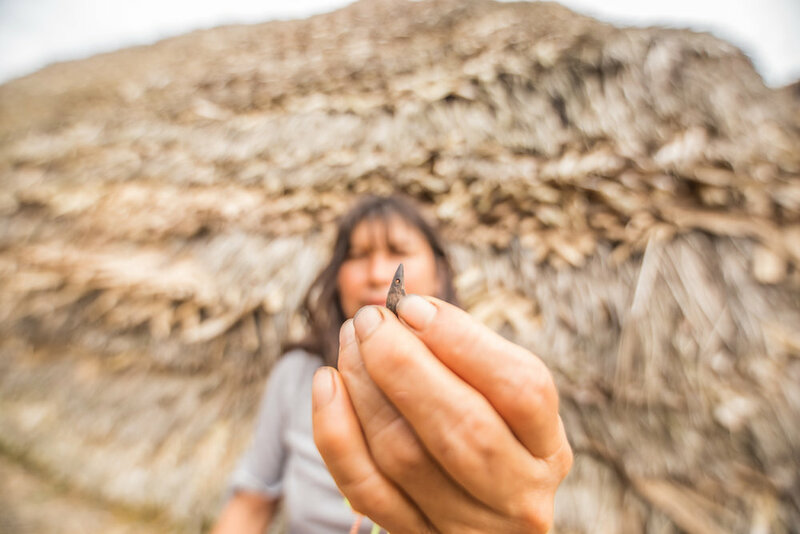 In our first 2 reports we have shown how our work and the fair-trade started with the Matsés, we have highlighted many ancestral arts and their processes including the uitsun bracelet, arrows and nënë tobacco. Later in this report we will follow the ancient and dying art of ceramics (which we have been fortunate to document for the first time), as well as other artistic traditions such as hammock, basket and jewellery making. We are currently working with approximately 80 Matsés artists, from young to old, male and female, please meet some of them here by flicking through our artist portrait gallery. Melisa, Matsés youth, in village meeting. 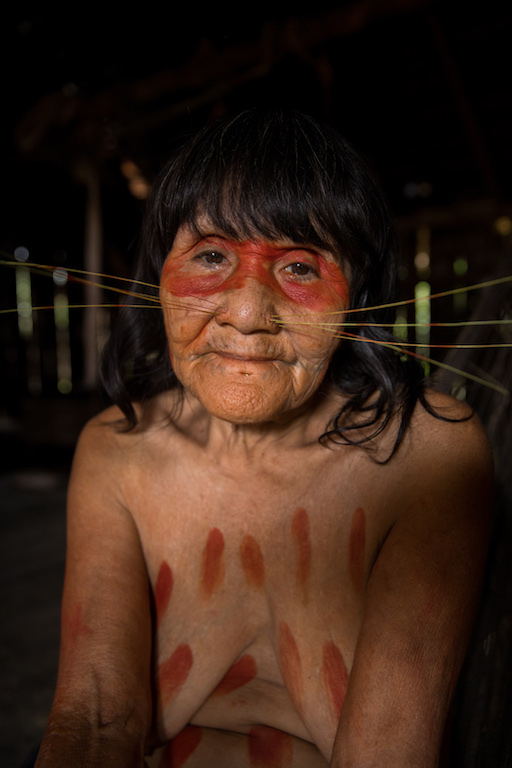 The trade with the Matsés is sensitive, complicated, fragile and above all, long! Art from the remotest villages will travel for days on a dugout canoe before a floatplane carries the art to Iquitos. From there the art is carefully packed before many more days of travel until it reaches our gallery, Xapiri, in Cusco. Segundo Reyna, the man in charge of organising the fair-trade with all the artists in multiple villages. Segundo Reyna explains how the fair-trade works. The art can take days of canoe travel before even reaching the jungle outpost of Angamos. Segundo picking up a new batch of harpy eagle feathered arrows. As dusk falls in Matsés land and as in most of the Amazon, activity stops and families congregate at home to share food and conservation. In Matsés villages today, and like how it was 50 years ago before western contact, ‘shupiwii’ torches flicker in smokey homes as families settle down for the evening. Shupiwii are traditional torches made with copal resin - wrapped in palm leaves, the torches last for several days and are still widely used today to light homes during the evening. It is at night time when families get together, share food and stories as the ancestral transmission takes effect. On clear nights, the milky way lights up the sounds of the jungle and the ancestral wisdom from this remote corner of the Amazon rainforest recharges. 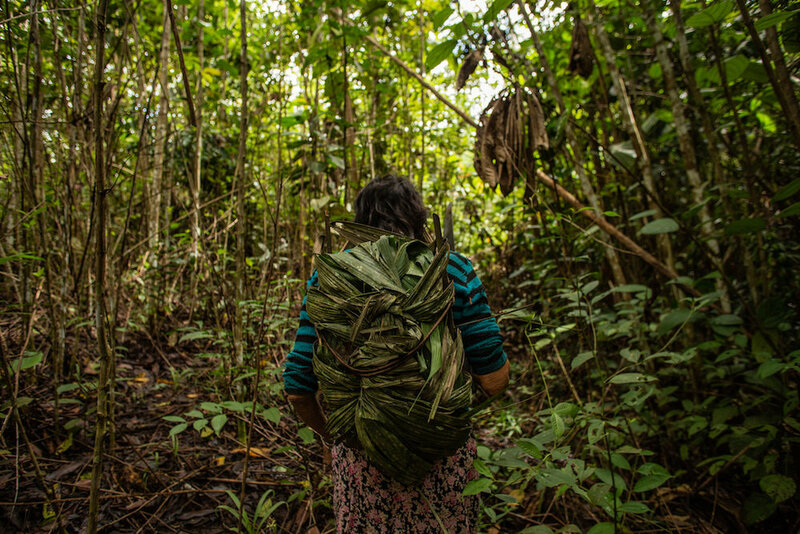 Alternative models for sustainable income are now becoming a reality for the Matsés, moving away from destructive extraction industries to projects working with renewable rainforest materials, which as a result protects their jungle homeland. 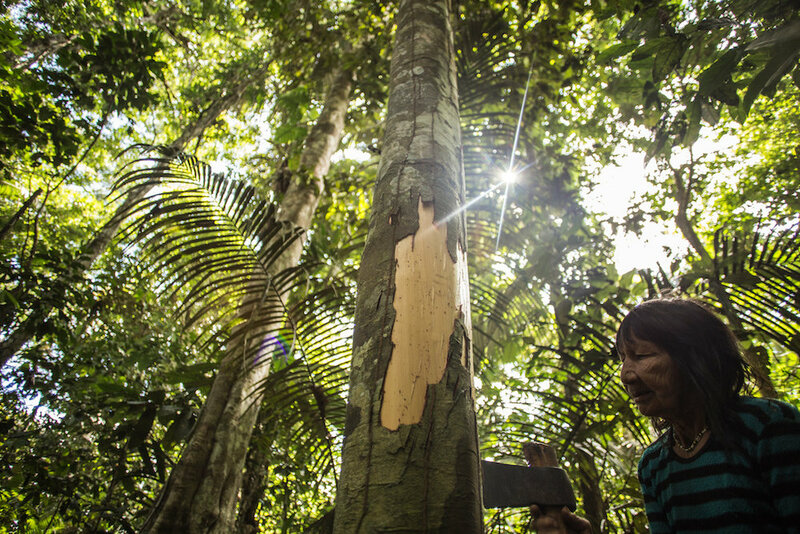 Timber extraction is an ongoing threat in Matsés territory. The most valuable trees, Mahogany and Spanish Cedar, have already been extracted, but timber entrepreneurs are still constantly trying to convince and bribe the Matsés to allow them to log the less valuable species in their territory. 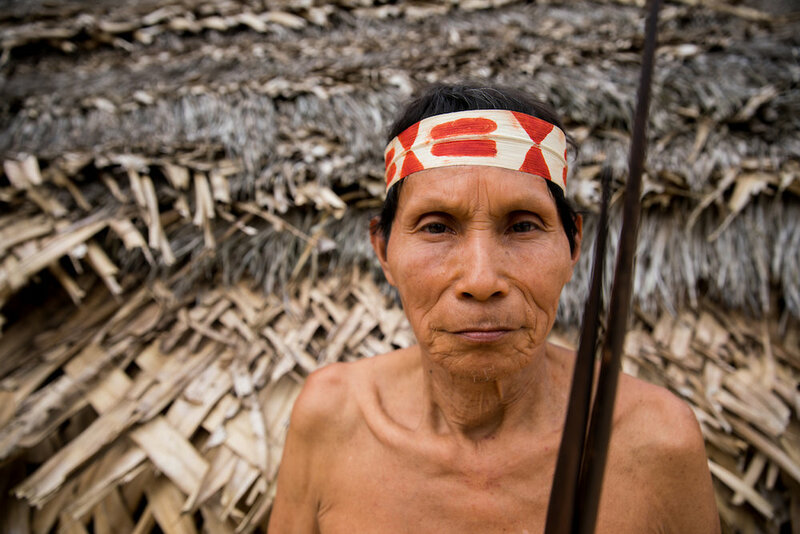 Because they have few other economic opportunities, the Matsés have made deals with timber companies several times in the past. In addition to the obvious ecological detriment to the forest, working timber has many other negative aspects: 1) men spend many months away from their homes where they cannot attend to their families’ need; 2) timber work is toilsome and dangerous; and 3) it is low-paying and the Matsés are often cheated when they sell their logs, and often are not paid at all. There is no way to prohibit these pernicious activities, and “conservation education” is ineffective in consequence of the Matsés desire to obtain money to purchase Western manufactured items. Acaté’s solution is to give the Matses options by finding markets for renewable rainforest products such as copiaba resin. Copaiba is a large hardwood tree abundant in Matsés territory. Interestingly the Matsés did not know about the benefits of copiaba before, and as it had no value to them, they would often fell this tree when doing their slash-and-burn agriculture. Now and thanks to the project with Acaté the tree is now conserved (away from the loggers) and acts as an important source of sustainable income. To access the resin, a large custom made drill of 2 metres is angled deep into the tree leaving a passage for the resin to naturally drip down and be collected in plastic bottles. After collecting the resin the tree is then corked, protecting the tree’s health ready for the next collection. Urbano, one of the Matsés responsible for collecting the copaiba resin. The golden amber-colored resin is prized for its medicinal properties from being a potent anti-inflammatory to having anti-fungal properties, as well as its use in cosmetics. Copaiba is unable to be easily sourced in most settled areas of Amazonia, because, just like the hard wood mahogany, the trees are quickly cut down and sold off for pennies of their final market value. Thankfully, copaiba trees still stand tall in several areas of the rainforests protected by the Matsés. The work has been hard with many pitfalls, but the perseverance, strength and determination of the Matsés people have made it a viable reality. 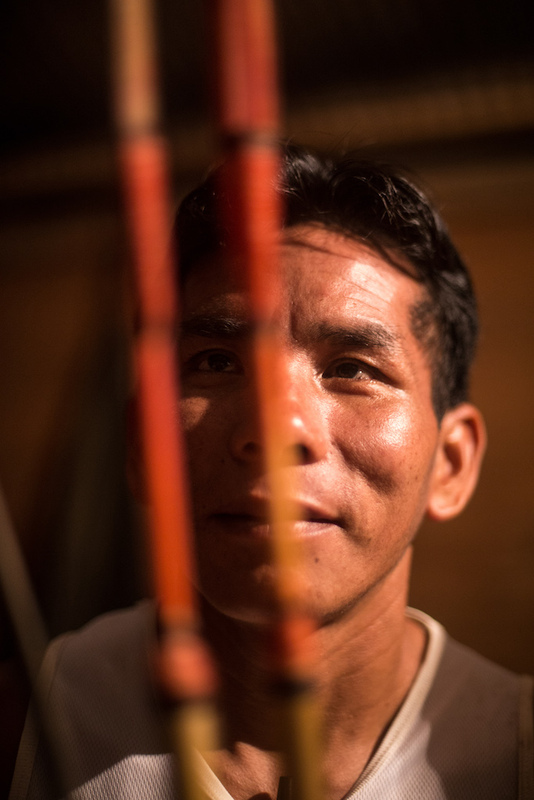 Through the careful and considerate harvesting of the resin, the Matsés can realise a sustainable income stream that lessens their dependency on external aid or the lure of the petroleum industries. It provides alternatives to bush-meat hunting and timber extraction and brings real revenue to their communities. This pure resin is sustainably extracted directly from the tree, cold filtered through cheese cloth and bottled. 100% natural, undiluted, with no additional oils or fragrance added unlike other Copaiba ‘oils’ on the market. 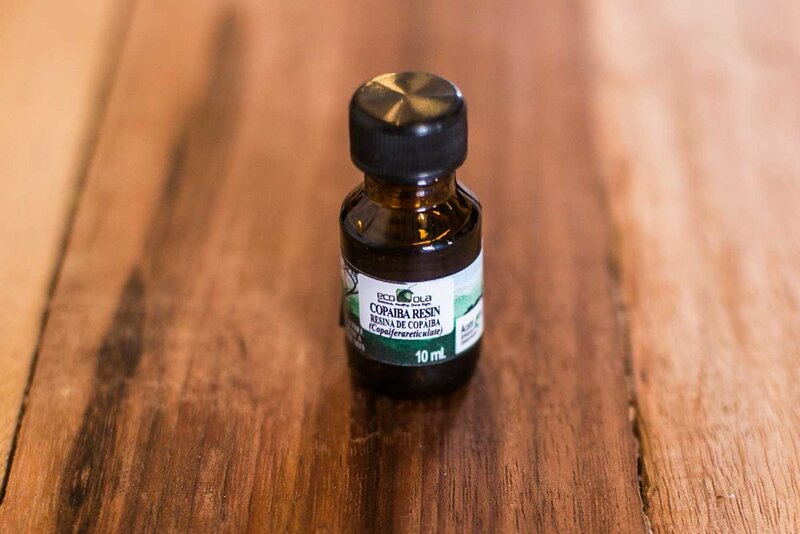 This is not the distilled oil commonly offered, it is the pure unadulterated resin from the heart of the tree and it is in this resin where most of properties are stored. Support the Matsés and buy here. 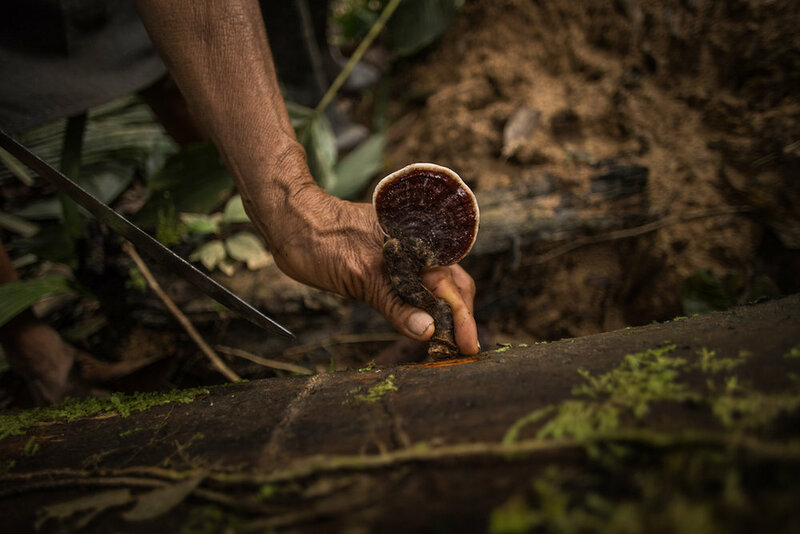 The sustainable harvest of reishi mushrooms (Latin name: Ganoderma lucidum) is a new project the Matsés and Acaté are currently developing. 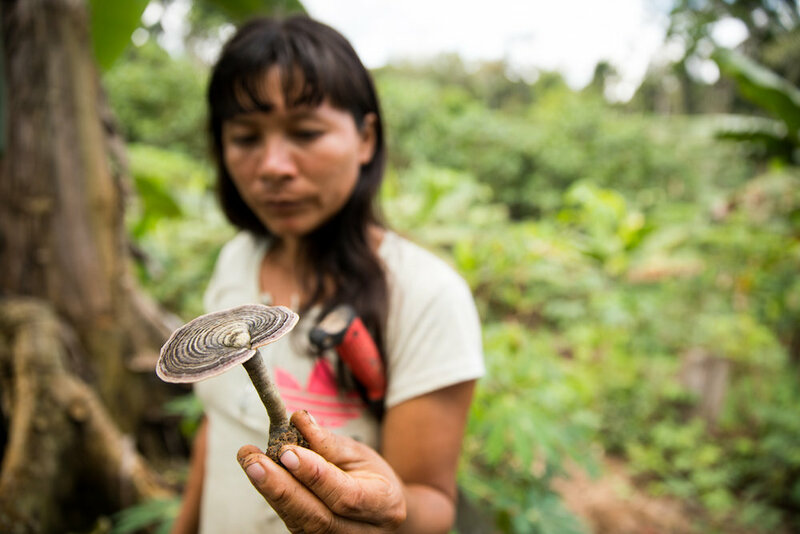 Like copaiba, before this project, the Matsés did not use these mushrooms in their traditional customs. The reishi are similar in properties to Chinese medicinal mushrooms, boasting benefits for boosting the immune system; viral infections such as the flu, lung conditions including asthma and bronchitis; heart disease and contributing conditions such as high blood pressure and high cholesterol; kidney disease; cancer; and liver disease. “Viable sustainable economic projects are the Holy Grail of conservation initiatives. The hardest to develop and the most effectual, such projects offer the best hope to stem the tide of unsustainable destructive activities worldwide. Even the most recently contacted indigenous groups, such as the Matsés, who still today largely subsist on traditional sustenance activities—and thus retain a high degree of self-sufficiency—are increasingly drawn into the cash economy to obtain basic household needs, including outside Western medicines. From our work with the Matsés and other groups, we’ve repeatedly seen first hand that local inhabitants generally don’t want to engage in these extractive industries. Mining brings exposure to a cesspool of disease and toxins. Timber cutting and extraction is a backbreaking and highly dangerous activity for which communities profit extremely little from the export of valuable hardwood used to produce high-end furniture. Most of the money earned in timber extraction is tacked on by middlemen and never reaches the communities that bear the brunt of the destruction. Almost no one, indigenous or not, wants to sell out their land and future to corporate extractive industry only to have it become polluted and its vitality depleted. But where are the alternatives? William Park, sustainable agriculturist and co-founder of Acaté Amazon Conservation. The ancestral art of pottery is now only practised by a handful of Matsés women throughout their territory. Our vision, through the development of fair-trade, is for the younger generation to learn this dying art form to ensure this ancient technique is not lost. We followed Ana Bunu on a 30 minute canoe ride outside of the village in search of the right clay and bark needed to make the ceramics. A particular type of whitish clay is collected from the bed or the bank of a small stream, and strips of bark are peeled from a tree called “mui” by the Matses and “aparachama” in local Spanish (Licania spp. Family Chrysobalanaceae). These materials are wrapped in what we like to call a “jungle backpack”, which is made on the spot by plaiting palm fronds and attaching a tumpline made from the bark of a different tree. 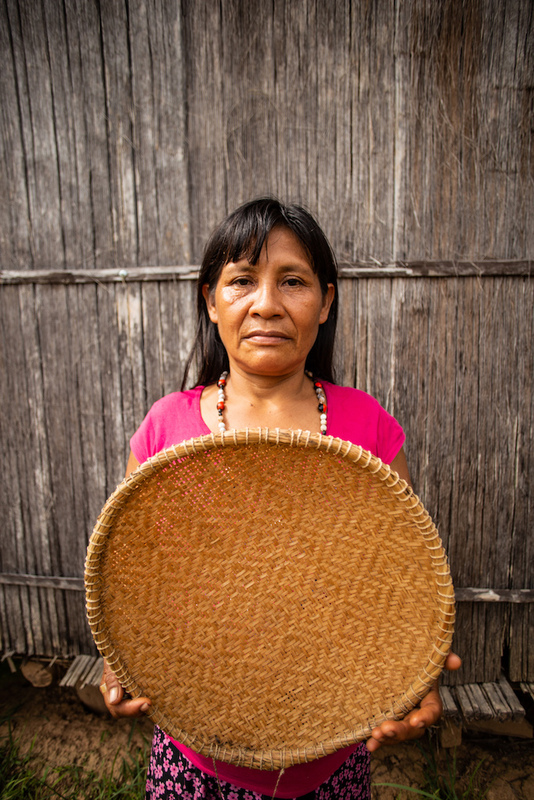 Ana Bunu, one of around 5 ceramic makers in the whole Matsés territory (Peruvian side). When back in the village the “mui” bark is burnt and then the silvery ash is sifted into a fine powder and mixed with the clay. The method of mixing the bark is in order to make the ceramic stronger as without, it would break easily. With the clay and ash mixed it is then rolled and constructed using the traditional coil technique as the ceramics take their form. The ceramic is then shaped with the shell of a freshwater clam and then the outside is smoothed with the coin-shaped seed of a liana (Mucuna sp., Family Leguminosae), which the Matsés call “pupu ëshë”, literally “owl eye”. Next, it is dried in the sun for a few hours before placing on the open fire to set. There are only a handful of ceramic artists left in Matsés territory. With time and through the fair-trade we are developing, the vision is to see the younger girls learning the ways. Ceramic making is a purely female practice and a vital piece of ancestral memory which must be transmitted to the new generations. Rosa Maya, an elder who was kidnapped from the neighbouring Marubu tribe when young adds geometric designs to her ceramics, a Marubu ancestral technique she has remembered and continued. After setting the ceramic she mixes clay with ash and finger paints geometric designs onto the ceramic. Then placing back on the fire to once more heat through the design. Finally the ceramic is cleaned with water to leave striking geometric designs. Rosa working with her daughter and teaching the method of painting the geometric designs, more ancestral transmission in action. Marubu — Matsés. if you are interested in buying Matsés ceramics please get in touch. Art is a fundamental part of Matsés culture. In this 3 part report series we have looked at many traditional artefacts from ceramics to bow and arrows. The Matsés also make a wide array of jewellery, hammocks and basketry so we will finish with some more images of the processes behind these special art forms. Art is of central importance in the villages and if this ancestral wisdom continues to thrive, so can the cultural identity of the Matsés. 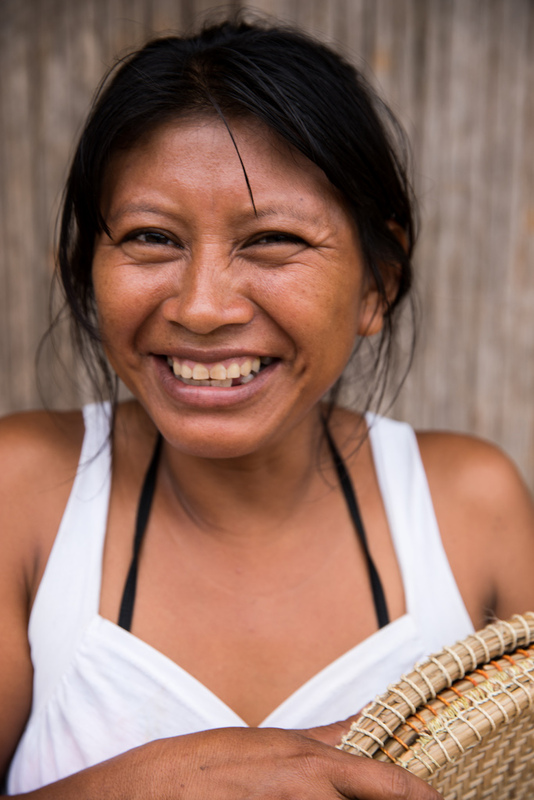 The Matsés make a wide array of jewellery using a huge variety of seeds and materials from the rainforest. With precise tools to make holes in the seeds, incredibly fine and detailed necklaces are created. Delicately fine and beautifully detailed necklaces, send us a message to see what pieces we have in stock. Made with chambira fibre as we featured in report 1, the full making process can take weeks but the result is a beautiful and strong hammock which will last years even in the most humid of rainforest conditions. Today the Matsés are in the process of assimilating to Western society, and it is in their material culture where this change is most obvious: clothing, motorised boats, tin roofing, and even cell phones (despite the lack of phone service) are universal in all the villages. But the older Matsés still possess the knowledge to live in the traditional way, and among our goals is to motivate its intergenerational transmission. 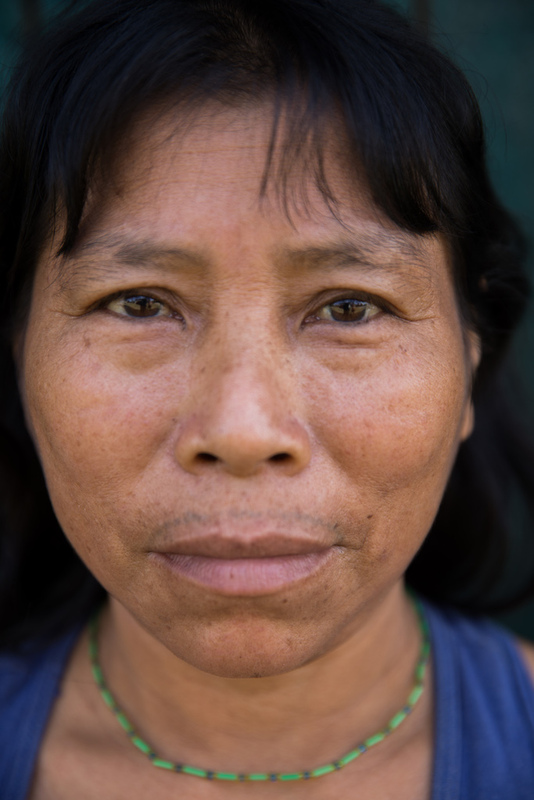 In the 1970s, shortly after the missionaries established contact with the Matsés, some sons of captive non-Indian women travelled to the Blanco and Tapiche Rivers to contact their mothers’ relatives. Through them, many unmarried young Matsés men found employment on these rivers with timber companies and worked with them for one or two seasons. All these men returned, found Matsés wives and became responsible traditional Matsés fathers. These trips might be compared to the Australian Aborigines’ walkabouts, and had the benefit of giving these men an opportunity to learn some basic Spanish and see what the outside world was like. In a similar manner, today many young Matsés men and several young women have gone to find work Iquitos, Requena, Yurimaguas, and even Lima and other coastal towns. The difference in the current case is that many of these young people are not coming back, and in doing so some have permanently abandoned their wives and children. 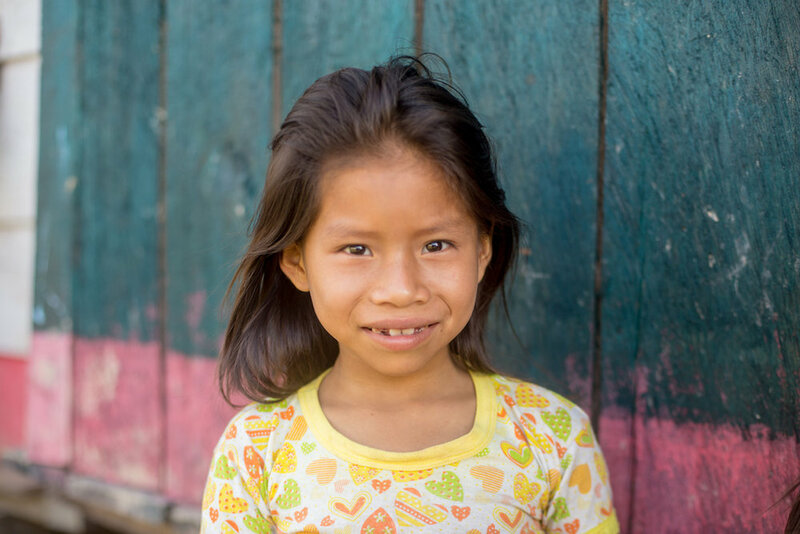 Because of the inadequate education they receive in the Matsés villages, they obtain menial, low-paying jobs at which they must work two shifts. In light of their poor conditions in the cities, a few return to their villages, but when they find that they do not have the skills to farm or hunt effectively so they end up returning to the cities. It is also common for young Matses men to join the Army, despite being married. 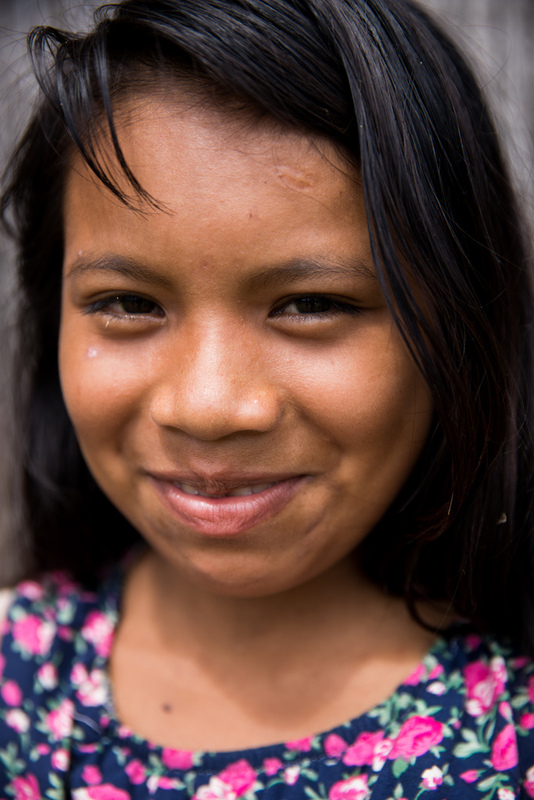 Nevertheless, among the Matsés youth, going to live outside Matsés territory is considered prestigious, and seems to be a legitimate excuse for abandoning one’s spouse and children. Acaté is helping to improve this situation by providing economic opportunities that will allow young people to obtain money without leaving their villages. This is why our work through Xapiri and the fair-trade of art and renewable resins is key if the Matsés are to remain in and protect their territory. The unifying core at the heart of all of Acaté’s initiatives, from the traditional medicine to copaiba projects, is to maintain indigenous self-sufficiency and self-determination, to help the Matsés adapt and evolve to a rapidly changing world of technology and globalisation, but at the same time retain their proud identity as Matsés for generations to come. 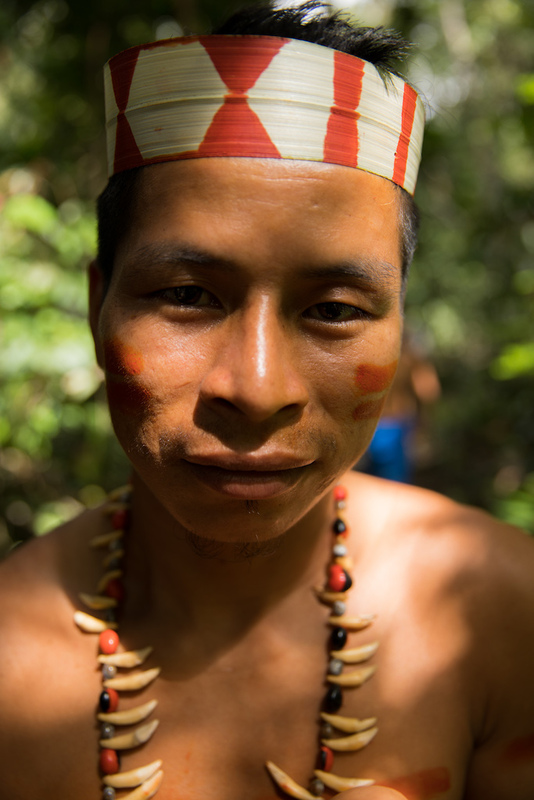 Through bridging generational divides created by the divisive forces of acculturation, the Matsés will continue to protect the extraordinary rainforests that their ancestors fought and died to save from industrial extraction and the incursion of colonialists. The future is now for the Amazon. Together we must learn from past mistakes to ensure the immense wisdom held in the Amazon rainforest remains, by keeping the ancestral transmission and thread of knowledge intact.